Android Wear grew really fast in the two years of its existence. At Google I/O 2016, the company showcased parts of the latest Android Wear 2.0 and it looks refreshed. With the latest version of Android Wear, smartwatches running it will be completely standalone and won’t require a smartphone as a companion. Devices will connect to Wi-Fi networks automatically, and will rely on cellular when you’re out and about. The biggest change comes in the design, though. Google released new and enhanced Material Design guidelines for Wear 2.0. You can check them in the source link below. Lastly, Android Wear 2.0 introduces new input methods as well as standalone apps. 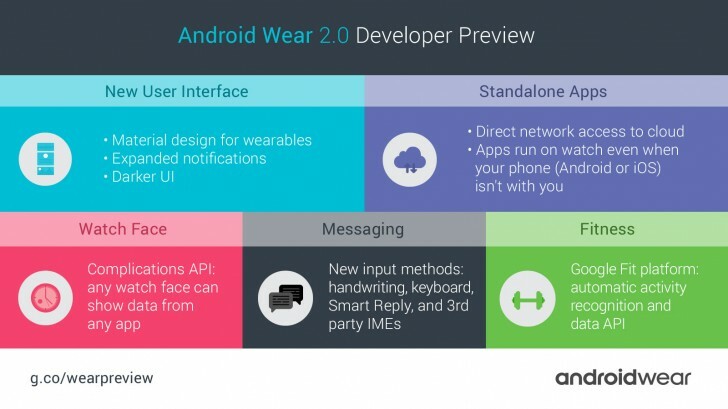 Android Wear will be available later today as a developer preview. It’s only compatible with the LG Watch Urbane Seccond Edition LTE and the Huawei Watch. More watches will be added as part of the Wear 2.0 update later on, like the LG G Watch and Samsung Gear Live. Expect the update to become widely available some time in the fall.